By Gregory – Privatisation is a relatively modern phenomenon, defined as the transfer of a business, industry or service from public to private ownership and control. The privatisation of state owned companies started in the 1950’s under Winston Churchill. It was only in the 1980’s however that privatisation gained worldwide momentum under the leaderships of US president Ronald Reagan and British Prime Minister Margaret Thatcher. Why privatise? Well, according to many economists and the British magazine ‘The Economist’ companies do best when they are privately run (The Economist – 03/09/2011). Privatisation, according to some, consistently improves efficiency. Myth or reality? Let me go back to that statement and ask a question: companies do best when they are privatly run…but for whom? Last week we’ve seen that we cannot rely on private companies for services that should benefit the national intrest. G4S, the private security firm that was supposed to protect the London Olympic Games, failed so far to deliver. The UK government announced in recent weeks that 3500 troops would be drafted in to cover the short comings of the security firm. Manchester police have been asked to fill the gaps as only 9 of the 140 G4S recruits attended a training session that will prepare them to protect the Olympic football matches held in the city. There are many more examples across the country. 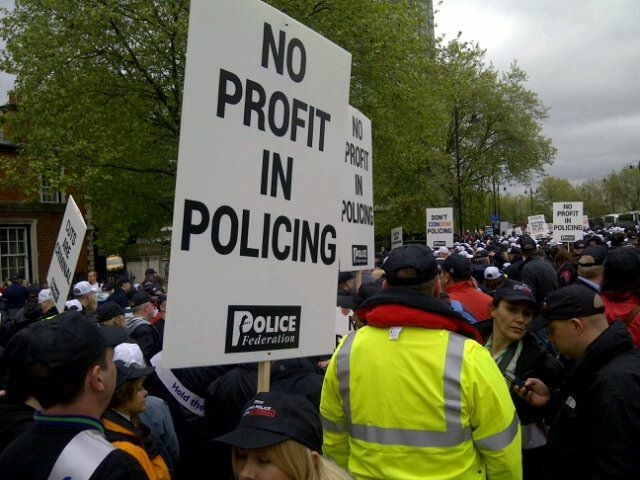 No wonder that three British police forces who were considering outsourcing support jobs to the private sector are now reconsidering their plans. So far G4S has refused to give up on it’s £57 million managment fee for Olympic security as that is not in its interest. Due to the Olympic security fiasco we hear the first voices in British politics in favour of reversing this privatisation and outsourcing trend. 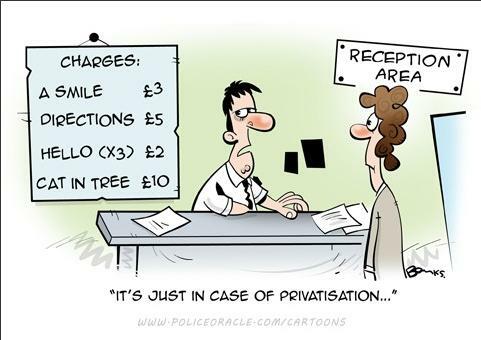 Ed Miliband, leader of the Labour Party, said that public-private partnerships were an important part of modern policing but that large scale outsourcing and privatisation of police forces had to be stopped. Outsourcing or even privatising security is clearly not in the public’s best interest. On the other hand we can not expect the government or state to run all businesses, as that would bring us back to 20th century form of Communism, which clearly failed too as there was no competition and thus no reason to be efficient. Therefore it is important to make a distinction between sectors with a national interest and sectors with a commercial interest that should be opened for healthy competition. Security, policing, army, public transport and education are examples that many argue should belong to the public sector. These sectors, if transferred to the private sector will not create the kind of competition that is required to allow a more efficient service. Let’s take Britain’s Railway as an example. If I need to take the train from London to the port town of Dover, I have no other choice than buying a ticket from SouthEastern trains. Water supply is another good example. If you live in London then your water is supplied by Thames Water. By creating private monopolies in those sectors the incentive of being more efficient is non existant as there is no real competition. As a consumer you have no choice. There is also the issue of accountability. Most dictionary definitions of privatisation include the words ‘private control’. If the police force were to be privatised, who would they be accountable to – and who would ‘control’ them? . Their shareholders – whose only interest is to create added value for themselves in terms of money and the price of their shares, or the government – whose sole task is to act in the national interest and measure added value in non-financial terms? We have recently witnessed the banking industry acting in a self-serving way that is totally against the national interest or the interests of its customers. What commercial pressures might influence the behaviour of a private police force? – in whose interest would they really be serving? The argument here then is that privatisation must only be attempted where issues of national interest aren’t at stake and where accountability and control can comfortably be left in private hands. For those industries and services that could qualify for privatisation, they seem to work best where moving control away from the state creates immediate and tangible benefits for consumers. Privatisation is not the answer to making an industry or service cost-effective and efficient unless it enables this competition. For governments looking to find efficiencies in areas such as education, health and public transport, they might better look at alternatives such as partnerships and co-operatives, where all members of staff, or of a community, own a share of the business, and have a vested interest in its performance and success. ← London Olympics: curse or legacy?